If you have ever come across a web designer with jaw dropping design portfolio, or a content manager with a stellar industry blog, you can bet the majority of that work happened when they were unemployed. Why? Because when you are employed (and doing your job), you are busy living and breathing content or building websites or developing software for other people. So, if you find yourself not working for someone else at the current moment, take a day or two for Chinese food, Cheetos, and ALL THE NETFLIX and then succumb to the realization that you now work for yourself. 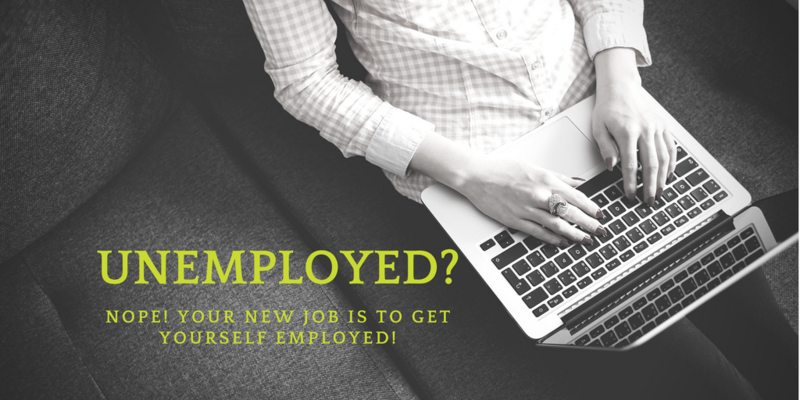 So now that you are your own boss, and your task is to get yourself hired, where do you start? Here are five important steps to take when working to get yourself hired. Put on your hiring manager hat, take a swift look at all your social media channels, and clean them up a bit. Next, Google yourself, make sure there is nothing alarming there and hide or work to remove any unwanted bits of information. Refresh your profile photos for a more professional impression, join all the LinkedIn groups, ask for endorsements, and close or hide any old, outdated accounts, i.e., Myspace. If you generate income from any type of design capacity, you need to show your work. If you are short on time and prefer to showcase your work within a community environment, Behance, Carbonmade, Dribbble, and Contently are all great avenues for throwing your work out there for the world to see. If you are more focused on your personal brand, a website is the way to go. Check out Squarespace, Wix, or good old fashioned WordPress for a wide variety of easy to use portfolio themes. When updating your resume, you need to cover all the bases and now that you are unemployed, you have plenty of time to do it right. Your resume should be available as a .pdf and a simplified, text only Word Doc version. The Word Doc is important when working with recruiters because they are typically required to send your resume to the client in one general format. Use our resume tips to streamline and target your resume for the job you are applying, review it until the cows come home and then send it to a friend for a final once-over. Now that you have mastered your new role of finding yourself a new job, the next step is to make it happen. Click here for current open positions, apply, and one of our recruiters will catch up with you.